There are a lot of cinematic universes kicking around Hollywood right now, but most of them aren't doing so well or, at the very least, they aren't really ready to actually hit theaters yet. However, The Conjuring universe is doing great and is gearing up to expand an awful lot in the coming years with more spin-offs and The Conjuring 3. Now, mastermind James Wan, who directed The Conjuring and The Conjuring 2, has provided a massive update on the Conjuring universe, including where they are at with with the next true sequel, as well as the status of The Crooked Man and The Nun spin-offs. James Wan recently spoke extensively about The Conjuring movie universe with Entertainment Weekly. Starting with The Conjuring 3, he reveals that they are currently working on the script and trying to get things exactly right. Here's what he had to say about it. "When we were starting out, when we made the first Conjuring, we always kind of quietly, jokingly, among ourselves, felt that the world of the Warrens, and all the interesting artifacts they have in their haunted room, could have their own stories and therefore spawn movies. We had hopes and aspirations but we never thought in our wildest dreams that we could actually go on and do it...We've been working hard on Conjuring 3. Of course, that is something that I am not neglecting. 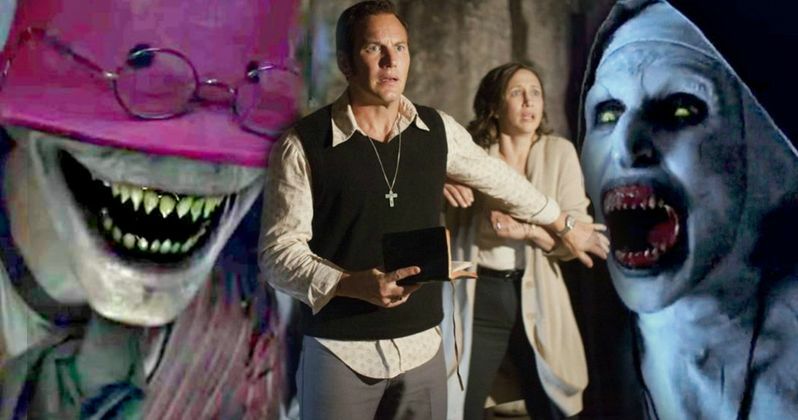 The Conjuring movies are still the mothership and the mothership needs to be strong. [Laughs] The mothership needs to be strong for all these other jet fighters to shoot out of. So, we're in the midst of working on the script, and still hashing [it] out. We want to make sure that the script is in a really good place. With how much people have loved the first two Conjuring, I don't want to rush into the third one if possible." In the years since The Conjuring arrived James Wan has become an absolute force in the industry. He made one of the highest-grossing movies of all-time with Furious 7 and is currently directing Aquaman for the DC Extended Universe. Unfortunately, that may actually get in the way of him being able to direct The Conjuring 3. "I just don't think it's realistic with my schedule. I'm going to be on Aquaman for a year-and-a-half. I just don't see that as a reality." Sad as that may be, he is still heavily involved as a producer and with filmmakers like David F. Sandberg (Lights Out) working on Annabelle: Creation, which is currently generating a ton of positive buzz, as well as Corin Hardy (The Hallow), who recently wrapped filming on The Nun, which centers on the demon nun from The Conjuring 2, there are other guys who can do the job. The Nun is set to arrive next summer and, according to James Wan, they definitely found the right guy for that particular job. "I love Corin. That guy is amazing. I put Corin in the same camp as David. You know, like, really young, hungry, upcoming filmmakers, full of passion for the genre. Corin is such a monster movie-nut and I just love the guy's passion. All these up-and-coming filmmakers remind me of what I was when I started with Saw. That's the kind of filmmakers I would love to continue to foster through Atomic Monster. So, I'm very excited for what Corin has done with The Nun, and right now we're in post-production, putting the film together." Also being developed as a spin-off from The Conjuring 2, it was recently announced that New Line is working on a movie centered on The Crooked Man. The movie is in the very early stages and not much has been revealed, but James Wan did give us a little bit to chew on in terms of what to expect. According to him, it is going to be unlike anything in The Conjuring universe and will be more of a dark fairytale. "Early stages, kind of like cooking away. But we think we have a really exciting story. What we want to do, with The Conjuring universe, is we want each of our little offshoots to have a very different flavor, right? So, for example, Annabelle is the classic sort-of haunted doll subgenre. And with The Crooked Man, I would love to push it more down somewhat of that dark fairytale, and more whimsical, subgenre. I love the idea that, within the Conjuring universe, each of our little movies all have their own flavor, so that way they don't feel like they're the same films." That sounds like it would be more in line with something like Pan's Labyrinth, which could be a nice change of pace for these movies. It sounds like James Wan knows what he's doing and that we could be seeing a lot of quality horror movies in this universe in the coming years. If we're lucky, we may even see a big monster team up movie, but don't bet on it. James Wan said, "If I could pull off an Avengers of the Conjuring universe, I would love for that to happen. We'll see. It could be fun." That doesn't seem to fit with the tone, but let's not put anything past Wan at this point.